It's time for another year of creativity with our monthly Artist Trading Card (ATC) swaps! We love hosting these swaps and really enjoy seeing what all you creative souls come up with! To make it easier, I've compiled all the information you need to take part in this one blog post. Please refer to this post before sending in your completed ATC's. Each swap will have a different theme. You can find the upcoming themes and the due date in the side bar on the left. All Darkroom Door ATC swaps must use Darkroom Door rubber stamps or paper product as their main feature. Inspired by Australia Day, which is celebrated on January 26th each year, create an ATC that uses the colours green and gold. The subject matter is your choice (it does not have to be Australian related). Use any Darkroom Door stamp image or paper product to create ATC's with a vintage style! Create a pocket somewhere on your ATC. Place something inside, like a tag or other element that can be taken out and put back in. Use fabric, pastes, gels, moulding materials, paint, metal, embossing powders or any other material or substrate to create texture in your artwork! Use a metal embellishment, metal sheeting or create the look of faux metal for your ATC's! This will get those cogs ticking! Create something interactive on your ATC. It could be a pocket, something that opens, or slides or something that moves. The receiver needs to touch it in some way to see what it does. Time to get messy with some spray action! There's lots of sprays and mists available these days or you can create your own! You can spray the background, spray the stamp or spray whatever you like on your ATC! Time to get all spooky and eerie. We know those Photobooth people must have a dark eerie past, or the houses and cottages are haunted. Maybe the streets of London, Paris, Sydney, Prague etc are over run by ghouls. Spook me! Create ATC's that use a combination of blue, white and silver. You can use just one of the colours, two or all three! 10 ATC's for 9 in return. The 10th ATC will be kept in the Darkroom Door ATC Collection. If possible, try to send your ATC's in one of the trading card sleeves that hold 9 ATC's or similar. it's just a lot easier if they are in some type of sleeve system so I can see the whole collection easily, and it makes it a lot easier to sort. The ATC in the top left corner will remain there as yours, the rest will be swapped with others in the swap. Check out our ATC supplies here. Please refer to side bar for the closing date of each swap. If you've never created ATC's before - Wikipedia has a description here. Do you need to sign up? No, there's no need to email us if you're going to take part. Just have your swap in by the due date and you'll be in the swap! How long will it take before you receive the completed ATC's? I like to have the ATC's swapped within 2 weeks of the closing deadline. However this can change depending on my travelling schedule. Please allow 4-6 weeks for return of your ATC's, especially if you are international. * Please remember to write your details on the back of each ATC: Name, email, edition number (1/10, 2/10 etc), and that it was created for the Darkroom Door swap! * Everyone's swap pieces will be made into a gallery and will be available for viewing on the Darkroom Door blog after the swap is completed. * Australian swappers: Please include an addressed and stamped return envelope or satchel with your swap. As some ATC's can be quite thick and bulky, especially as some of our themes this year are textured - please use a medium to large envelope to ensure the ATC's fit in. * Please allow enough time for your swap parcel to arrive here in time!! International players should have their parcels sent two weeks before the due date. If you have any questions or need any further information, please email us at info@darkroomdoor.com and we'll respond as soon as possible! Check out some of our past ATC Swap Galleries on the left side bar. We also have many video galleries on our YouTube channel. I used an acrylic block as a palette, to watercolor with these Distress Inks. To finish off the card, I attached some Film Strip Ribbon and twine. A stamp from the Photography set was used at the bottom of the card, and some Paris Wordstrips. I also used the Castle Photo Stamp on these ATCs. I stamped the image with Ranger Archival ink, cut it out and inked the castle with these Distress inks. I've cut the image in half. The ATC backgrounds have acrylic paint brushstrokes, and I stamped the Stone Background with Archival Ink #Aquamarine. I also inked the edges with Aquamarine ink. For a finishing touch I used Paris Wordstrips again, colored with Distress Ink, and some Film Strip Ribbon. Great tip from Connie: After cutting out some of the wordstrips, tape the rest of the wordstrips at the back to keep them together. Hi stampers! It's Godelieve here today. I started this card with two ATCs. On the first ATC I stamped the Journey Quote stamp on a Distress Ink background and heat embossed with clear embossing powder. I distressed the edges and glued it onto green and black cardstock. I have cut one image of Sydney Photochips to ATC size, inked it with Distress Ink #Bundled Sage. Distressed the edges. I punched a hole in the tiny tab (Sizzix Die) before I stapled it onto the ATC. 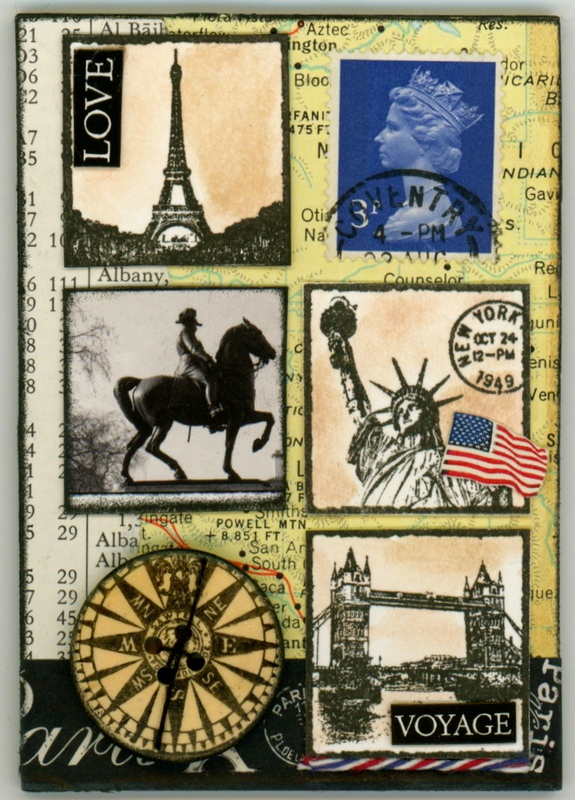 The World Map was stamped on an acrylic background and glued onto my card. The Darkroom Door Artist Trading Card swap theme for September is Anything Goes! Usually most of you create 10 identical ATC's for your swaps - however if you wanted to create 10 different ATC's to use up little bits and pieces (Wordstrips/Filmstrips/Montage images etc) then you are most welcome to do so! This is a swap to create ANYTHING! So go for it and get creative. Click here for all the info on how to participate. The closing date for this month is 30th September 2013. I'm really looking forward to seeing what you all come up with! Hi everyone! It's Susie here with some ATC's using the Travel Inchies stamp set! 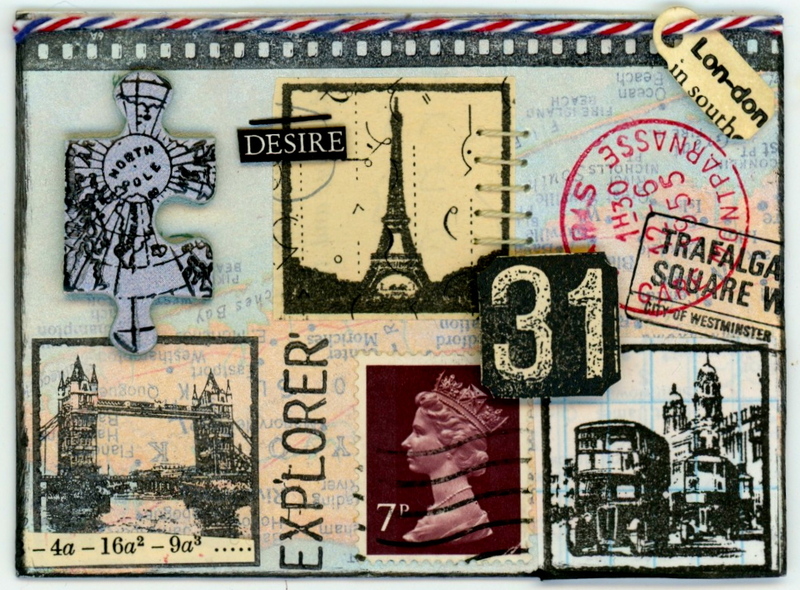 Darkroom Door's latest inchie stamp set 'Travel Inchies' is fabulous fun! I enjoy working with tiny, miniature sized things, so this set of travel inspired inches has brought much inspiration (and an even greater desire to adventure up to the northern hemisphere again one day!). 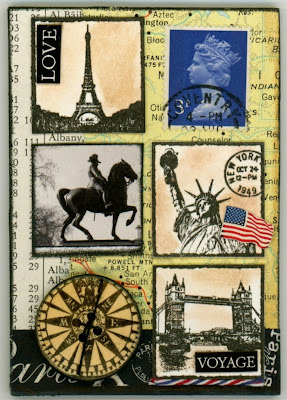 This first ATC includes some layering of vintage atlas papers and a lovely washi tape to create the background. I stamped the inchies on white paper and created the tea stained look with Ranger's Old Paper Distress Marker and an Aquash brush. I stamped the compass inchie onto a wooden button too. The photograph is from Darkroom Door's London montage collage sheet, cut to an inchie size. I embellished this piece with airmail twine, an English postage stamp, words for Darkroom Door's Prague Vol 2 Wordstrip and also cut the flag from an USA postage stamp. This next ATC has been created for Darkroom Door's Anything Goes ATC swap for September, so if you participate, you might find one of these in your new collection of ATC's! Once again I've used a page from a vintage atlas to create the background and painted a layer of Pearl White paint over it. I stamped the London Bridge directly onto the ATC and added a piece of vintage paper to it. The other inches were stamped onto various papers and a jigsaw piece. I used some other Darkroom Door stamp sets to further embellish this piece: London Vol 2, Steampunk, Photography and Montmarte. To complete this piece, I added another word from Darkroom Door's Prague Vol 2 wordstrip, an English vintage postage stamp, hand stitching, a staple, small tag and some airmail twine. 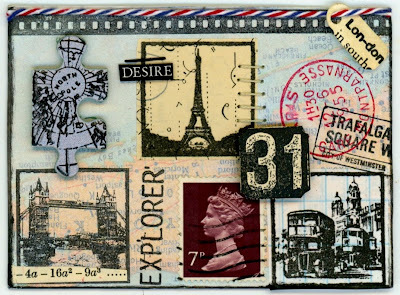 If you've never worked with inchies before, this stamp set is a great starting point, especially if you have travel adventures to scrapbook! I participated in this swap using the Bright Blossoms Montage sheet. There's 8 large images on the Montage, so I used all of them to create different coloured ATC's. Robyn used her Gelli plate to create the background then stamped over the top with the Bright Blossoms stamp! Very cool!! Judith embossed the Bright Blossoms stamp so it has beautiful texture when you feel it! I love how Tracey combined the Montage sheet with little doilies, tape and buttons! Jenny stamped onto textured paper which looks amazing! She's watercoloured some of the petals too - love how it softens it up and gives it a painterly look! 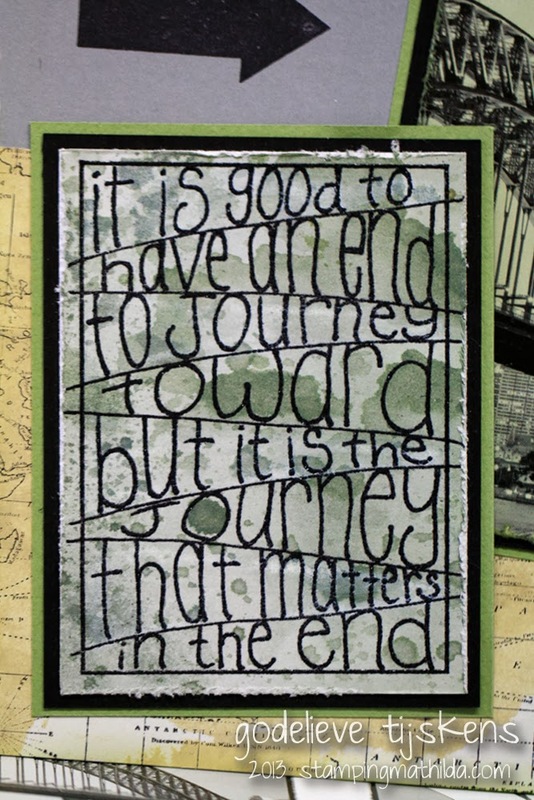 Love Vicky's use of colour in here ATC and how she stamped the quote onto vellum. Very pretty! Emilia has combined the Bright Blossoms Montage image with the Flower Garden Background Stamp! Love how vibrant there are on the glossy black background! Susie's work is always stunning - love the textures and layers in this ATC! Emilia sent in a couple of extra ATC's - these weren't a part of the swap but I wanted to show you anyway! Emilia has used the Sunshine Background Stamp with the Bright Blossoms Filmstrips. Love this! Thanks again to everyone who participated in the swap! If you'd like to join in our next swap, check out the details on the sidebar to the left. Have a great day! Thanks again to everyone who participated in the swap! If you'd like to join in our next swap, check out the details on the sidebar to the left. Thanks again to all the artists who took part in the swap! If you're keen to join in our monthly ATC swaps, please click here for all of the info! We'd love for you to join in! The upcoming themes can be found on the sidebar to the left.